You never really know what sorts of surprises you’ll find when you purchase a new home. Okay, so you probably won’t find many surprises in a recently built condominium– save for maybe a sock drawer the realtor forgot to mention– but you truly never know what you’ll find in a house with history. Take Corvette Forum member ‘Kerouac,’ for example. 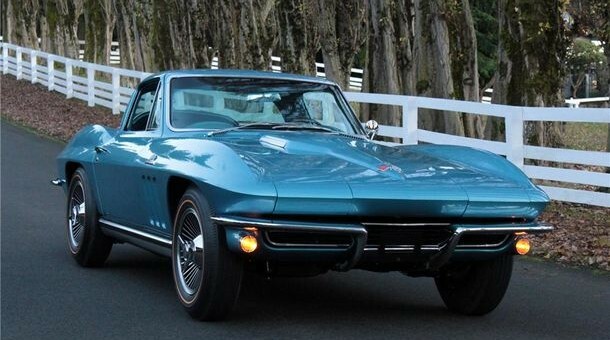 Kerouac recently purchased a house and garage which was built in 1914 and he soon decided to transform the garage from a slop-heap to a man cave in order to better store his Nassau Blue 1965 Corvette Sting Ray (with a 327/365 L76 V8 and a Muncie 4-speed). However, it soon became apparent that there was a surprise waiting for him below the floor of his two-car garage. Kerouac noticed some cracks in the floor and wisely decided to bring in some experts to pour a new cement surface. Noticing the cracks, the cement worker said, “I think you got a pit in there,” and started to chip away at the edges. After cracking through the surface, they uncovered a pit of loose dirt and rocks. They rocks and dirt began to pile up and all of a sudden the treasure was revealed: Kerouac had found an automotive servicing pit, lined with bricks, under the floor of the garage. Jackpot. Since then, Kerouac has been using a ladder to get in and out of the pit. He thought about installing a set of stairs but decided against it because it would steal too much floor space. So, there you have it folks. You never really know what you’ll find in and around your house. With that said, we probably wouldn’t recommend taking a jack hammer to your garage anytime soon. Head over to Corvette Blogger to see the newly found service pit and be sure to check out the finished man cave while you’re there. Not a rare find as many old garages have these that were filled in over the years. Too often local zoning will not permit these anymore. I have a friend with one that is ceramic blocked and has built in lighting etc. Too many areas termed these as safety hazards and they just will not let you build one. But now find one you can keep what was there.